Your dining room is probably one of the most used rooms in your entire home. It’s a great place to entertain your family and friends while enjoying a great meal together. Because of this you want it to look aesthetically appealing to both you and your guests. Here’s how you can decorate a modern dining room in 2019. One of the easiest ways to transform your dining room is to paint the walls. If you want to give it a modern feel, paint it a grey color. You can also paint stripes on the walls if you are looking for something very trendy. One of the nice things about using paint to spruce up your dining room is that it’s inexpensive. It also doesn’t take a lot of work as you can easily transform your dining room in just an afternoon. Keep in mind that if your dining room is very small, you should try to stay away from dark colors. They will just make the space look even smaller than it already is. Lighting can certainly make or break a dining room. To give your dining room a modern look, choose the right lighting. Be sure that it provides a lot of light. You don’t want your dining room to be dim and difficult to see in because you chose lighting that doesn’t provide a significant amount of light. 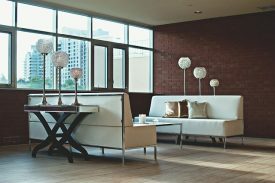 Dependent on the lighting fixtures that you choose, your lighting choice may have the most dramatic impact on the room overall. Modern dining room tables and chairs look sleek. Skip wood choices and opt for ones made out of metal. If you have a dining room table and chairs that you already love and don’t want to get rid of, consider sprucing them up a bit to make them look more modern. Add slip covers and choose place settings that look modern. Even a few decorative pieces added to a table or the right tablecloth can totally change the look of a table. One way to significantly change the way a dining room looks is to decorate the ceiling. You can do this in a few ways. You can paint the ceiling in a modern color. You easily do this by using just one color. You can also use plaster on the ceiling to create a design. Another option is to add a modern looking wallpaper to the ceiling. If you go this route, make sure that the walls of your dining room are painted in just one color so that the wallpaper and paint don’t clash. The last thing you want to do is to make the room look too busy. Whatever you decide to do just make sure that the finish product looks modern. 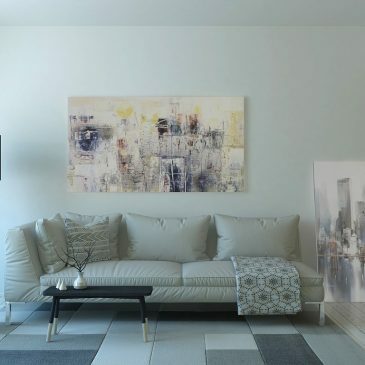 If you are all about keeping things simple and want to make your dining room modern without a lot of commitment, consider adding a few pieces of artwork. You can easily find numerous pieces of modern artwork that will fit your budget. Just make sure you don’t overdo it. Just a few pieces of art on the walls is better than having too many pieces. By choosing the right pieces of artwork you can easily give your dining room a modern feel without having to do anything else to it. Even inexpensive pieces of artwork can add a modern feel to your dining room. 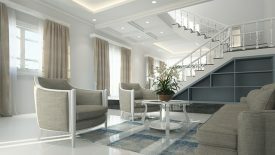 As you can see there are several things that you can do to make your dining room look modern in 2019 that don’t require a lot of work on your part. If you aren’t sure what bests suits your taste, play around with a couple of ideas. Just remember that a few subtle changes may have the biggest impact to the space overall.